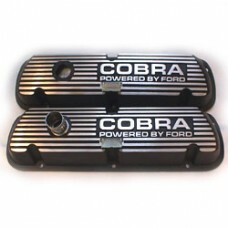 COBRA Powered By Ford valve covers for Cobra enthusiasts. These Ford Racing valve covers are not the cheap imitations. Valve covers are die-cast aluminium and feature black crinkle finish with satin polished raised detail. Application: All Small Block Ford 289, 302 & 351W. Will not clear late model production EFI. Will not clear after-market roller rockers without modification. Price is for a pair.